Internationally known for it’s unique personality, character and originality, the Artesania Rinconada Collection is is truly one of the finest examples of contemporary ceramic design and craftmanship. 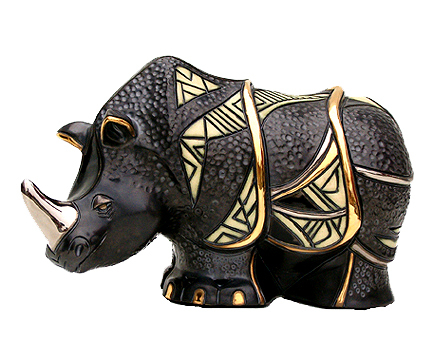 Each subject is carefully hand-carved and detailed from fine grain earthenware ceramic material then, after it’s initial kiln firing, decoration continues with the hand application of enamel colors and glazes used to accent and highlight individual design characteristics. Each enamel glaze must be re-fired individually in order to preserve it’s distinctive coloration. This exquisite collection of hand-crafted ceramic design was created by twin brothers Jesus and Javier Carbajales during the fall of 1972 in Montevideo, Uruguay. The Carbajales were born in Spain in 1930 and moved to Uruguay when the Spanish Civil War erupted in 1936. The brothers, however, did not forget their artistic roots. They were strongly influenced by Pablo Picasso, Salvador Dali and Joan Miro; three Spanish artists whose work dominated the first half of the 20th century. The Carbajales chose nature as their subject and their sculptures blend a traditional South American Style with a surrealist flair. Since their introduction in 1972, the artists have introduced over 500 original designs. Many designs have been retired over the years and are available through the secondary marketplace.Artesania Rinconada is a Spanish phrase meaning “Art of the corner” or “Corner art” and was chosen because the brothers worked out of a small corner of their living room for many years. Although Jesus and Javier can no longer confine themselves to a small corner studio, they still refer to their work as Artesania Rinconada and carve the initials AR into each of their original designs. 1998 marked the Charter Year of the Artesania Rinconada Collector’s Society, which was formed to keep collectors informed of upcoming events, new introductions and retirement of older designs. Members receive quarterly newsletters, a free special gift figurine and the opportunity to purchase Member Only figurines. 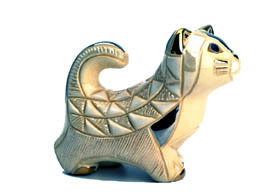 Pictured left is the first Rinconada Collector’s Society Figurine in 1998 – the White Cat. For more information visit the Official Artesania Rinconada web site.